This classic Italian Print Paper is silk-screened by hand in Italy. 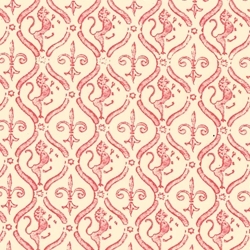 It features princely red lions scattered among a beautiful damask pattern that will embellish any project. • 100 GSM • 19" x 27" • Made in Italy • Acid Free See a complete description and more specifications below. Proudly display your creativity with this bold and beautiful Italian Print Paper. Carta Varese papers hail from northern Italy and are well-known worldwide. The papers are printed using a single-color machine, meaning each color is printed separately, one at a time. Because of this technique, the colors of Carta Varese papers are vivid and opaque. This Red Lion print paper can be used for a variety of uses including: gift-wrapping, collage, home décor, book binding, among others!